A pointing breed is a type of gundog typically used in finding game. Gundogs are traditionally divided into three classes: retrievers, flushing dogs, and pointing breeds. 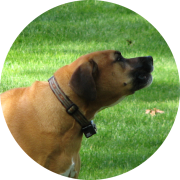 The name pointer comes from the dog's instinct to point, by stopping and aiming its muzzle towards game. This demonstrates to the hunter the location of his or her quarry and allows them to move into gun range. Pointers were selectively bred for dogs who had abundant pointing and backing instinct. Origins: Pointer dogs were initially bred to track hares. Description: Pointers are medium sized dogs with an agile athletic build. Size: Pointer dogs weigh 45 to 75 lbs, they stand 23 to 28 inches tall at the shoulder. Coat: Pointers have short sleek coats, that are liver and white, lemon and white, orange and white or black and white. Disposition: Pointers are even tempered, amiable dogs, they coexist with other pets and are not known to be territorial. Pointers are good family dogs. Type Dog: Pointers are hunting dogs. Litter Size: Pointer dogs give birth to litters of 5 to 7 puppies. Behavior: Pointers are patient, friendly, affectionate and they are good with children. Pointers are enthusiastic hunters but sweet tempered dogs. Life Span: Pointer dogs typically live 12 to 14 years. German shorthaired pointer dog mailing label. Sweet black and white pointer dog with a black eye. German shorthaired pointer dog in a field. German wire haired pointer dog breed for dog lovers. German Shorthaired Pointer dog photo design. German wire haired pointer dog breed for sporting dog lovers. Pointer dog return address label.